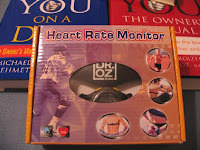 I am thrilled to show you the prizes I won from the Dr. Oz Show and BlogHer which arrived this week! 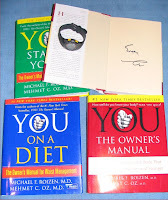 I am so thankful for the four autographed books by Dr. Oz and the Heart Rate Monitor! 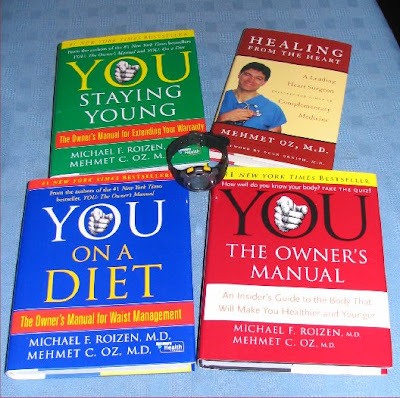 I've taken photos of all and you can see where Dr. Oz writes "Enjoy" and then his signature in the front of "Healing from the Heart". So cool! I *will* enjoy and I am! ...For example, when we do deep breathing in yoga exercises, we're consciously changing the release of peptides in the body. We are changing, perhaps energizing or relaxing, our emotional state. In this way our very breath can be an ally in healing. I have to grin when thinking about how the Law of Attraction plays a huge part in my life now. These books were gifts - well 'winnings' actually - that I normally would not have had the disposal income to purchase myself. They'll educate me as I continue this wonderful journey to my perfect weight and fitness! What an awesome give- away. Congrats on winning! I just became aware of Marci a couple of months ago. I was on a 6 week call with Marci and Kristen and David Morelli about happiness and prosperity. Very good stuff - still assimilating the material. Hope you have a wonderful week! Here's to a terrific, healthy week for both of us, friend! !